It has to be said, you guys: Maria Grace is kind of amazing. She's been a part of my Jane events from the beginning, and she always brings something amazing to the table. This year, as part of our focus on Emma, she's sharing with us a short story based on Harriet Smith's pre-Emma time, at Mrs. Goddard's school. 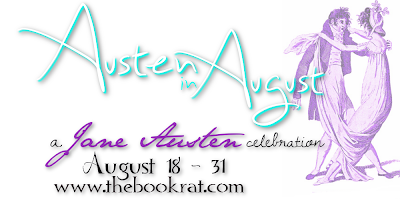 Every Tuesday and Thursday throughout Austen in August, a new chapter will be revealed! So click through and dig in with us, into Harriet Smith's backstory! And be sure to let us know your thoughts in the comments! Harriet Smith has abandoned all hope of a home and family of her own. After all no one prefers gingers. The tidy, snug school room at Mrs. Goddard’s hummed with students busy at their labors. Harriet hunched over the work table, staring at numbers that steadfastly refused to cooperate. Why must they be so stubborn? If only they would be obedient and behave like the little girls she minded for Mrs. Goddard! But no, they dare not be sweet like children. They insisted on playing wicked deceitful games with her. She pushed her workbook away. It was so unfair. Miss Osgood would not permit her to look up answers in the tables of her favorite housekeeping manual. When—if—she ever needed to sort out servants' wages, how much fabric to purchase to make clothes or how many jars were required for pickles, she would consult the wisdom of Hannah Glasse or Mrs. Rundell who were ever so much cleverer than she would ever be. Is that not why they published books with all that lovely information between their covers? But then, that would never happen. A girl like her, one with neither family nor connections, and, to make matters, worse, a ginger, would never have an establishment of her own. She straightened her back. It was not all dread and despair. She had a place here, with Mrs. Goddard. This would be her establishment, and her family would be the delightful little girls who flocked to her and loved her. Surely she should rejoice in that. Miss Osgood walked past and pulled her workbook back to its proper place. She tapped the taunting column of numbers with the end of her pencil. Harriet sighed and knotted her fingers in the soft fringe around her forehead. If she did not puzzle this out soon, she would be sporting a frightful headache the rest of the day. Two sharp claps rang from the far side of the room. Harriet and the girls around her jumped. “Your attention, girls.” Mrs. Goddard stood in the doorway, a fresh, spotless apron tied around her stout waist, and a crisply-starched cap framing her prim, matronly features. She stepped inside, two young ladies, probably near Harriet’s age and both taller than Mrs. Goddard, followed behind her. Poor dears, they looked a bit timid and definitely uncomfortable being presented in front of so large a group. Had they never been to school before? What an uncomfortable situation. There must be some way to make them more at ease. The girl in the grey-blue dress cringed just a little and curtsied. Harriet bit her lip and gripped the edge of her seat. Miss Rachel’s cheeks were bright and her gaze toward the floor, clearly uneasy being the center of attention. Every other thing about her seemed bright and cheerful and pleasant. Miss Margaret crushed the skirt of her red calico dress in her fists and attempted a smile. She curtsied, but her face was pale and something like worry creased the corners of her bright eyes. “They will be joining us as day students for this term.” Mrs. Goddard placed a hand on each girl’s shoulder as they looked at each other, a little wild-eyed. Mrs. Goddard’s eyes shone the way they did when she was pleased. “Indeed they may.” She ushered them toward Harriet. Harriet gathered her books and pencils into a neat little stack, leaving plenty of room for the newcomers. “Yes, Mrs. Goddard.” She curtsied and turned to the new girls. “I am Harriet Smith and am very pleased to make your acquaintance.” She smiled as warmly as she knew how. It was the best way to put people at ease. “Pray, sit with me.” She sat in the middle of the bench and patted either side. Miss Rachel sat to her left and Miss Margaret to her right. “Carry on with your lessons.” Mrs. Goddard trundled away. “You may put away your ciphering for today.” Miss Osgood strode to the far corner of the room. “Well, I…” Rachel stammered. Her cheeks tinged with pink. “But then again, he is usually cross about something.” Rachel rolled her eyes. “What shall we do?” Rachel’s brow knit, and she cast about the room. “Do not worry. You may share mine until you bring your own. I have ever so many projects begun, but have such a hard time finishing.” She giggled and hurried to collect her basket. They set to sewing, chatting about clothes, and gardens and books. What a very agreeable way to acquaint oneself with new friends. After dinner and a pleasant hour spent playing games in the parlor, Harriet helped Mrs. Goddard tuck the younger girls into bed. Once they were all settled in, Mrs. Goddard left and she read them another chapter from their favorite book of fairy stories. Someday one of them would probably discover that she had changed the ending of ever so many stories. They might be upset then, but heavens, those tales as they were written were so frightening and disagreeable! How could she not? To be sent to sleep with images of being eaten by wolves, having one’s feet cut off to stop dancing or being cooked by a witch? Certainly not her idea of the means to a peaceful rest! Harriet shuddered. She would risk their displeasure later if it meant they would sleep peacefully and dream pleasantly now. Indeed, several tiny snores confirmed some of them had drifted off even before she had finished. She tiptoed from the room. Mrs. Goddard stood in the doorway. She had been listening, too. “You are quite the story teller, my dear. I know for some, this is their favorite time of day.” Mrs. Goddard patted her hand. “They are all so sweet. It is a pleasure. My favorite time, too, I think.” Harriet shut the door with a soft click. She withdrew to Mrs. Goddard’s parlor where Belinda and Wynne, the other parlor boarders, amused themselves. Belinda sat with a sketchbook and pencil in her lap. She liked to be seen drawing. It made her look quite accomplished, she said. But was it a great accomplishment if her drawings were very poor? They might be better if she did not argue so violently with Miss Crowe’s every drawing lesson? Wynne worked on a piece of fine netting. Elegant, but not terribly useful, or at least it did not seem so. Still Wynne was most proud of it nonetheless. Harriet sat in her favorite chair, one worn and soft, near the fire. She spread the teaching sampler her future students would learn from over her lap. How pleasing that her guardian had been willing to provide lovely colored silks for her embroidery. The sampler she had been taught from was so drab and boring. The same stitch over and over, all in the same color. Her students would have something far more interesting to copy. An elaborate floral pattern with each flower boasting different colors and stitches. Not one was alike. True, her students might not be able to afford many colors with which to do theirs, but they would not be bored by repetitive stitches. A very good thing indeed. “It took you a long time to get the girls settled tonight.” Wynne did not look up from her netting. That was nothing unusual. She rarely graced Harriet with a direct look. “They were still very excited by our new students today.” Harriet squinted and threaded her needle. The scarlet twist was so pretty in this light. She liked to think of herself as the head girl at the school. As the eldest student, perhaps she had some right to do so. But it was still most vexing that she thought she knew more about everything than anyone else. Arguing with Belinda was pointless. She would not stop until everyone said they agreed with her, whether they actually agreed with her or not. Still it was maddening to sit there in silence and allow her to prattle on. “Think about it. To welcome them before we really know their characters, their connections? It seems a very unwise thing to me.” Belinda turned her nose up in her favorite oh-so-superior gesture. Why did she have to do that? She really was not so disagreeable when she was not trying to show off her grand manners and fancy opinions. “How can you say such a thing? Do you believe Mrs. Goddard would bring unacceptable company into our midst?” Harriet said. “Have you ever seen her turn away a paying student?” Belinda turned to her with that stare. The distasteful one, the one designed to remind Harriet that a girl who did not know and might never know her parents, had little place supposing she might know better than one whose father was a successful solicitor and who had an uncle who was a knight or a baronet or something that meant he was called ‘Sir’. Belinda was right after a fashion, though. Harriet really did know very little of the world. All she had was Mrs. Goddard and this school. She lacked the future prospects of so many of the other girls, so she had not bothered to apply herself to much that would not relate to her future, here as a teacher for Mrs. Goddard’s school. She swallowed hard. It would not do to become glum about such things. Mourning what one could never have brought only misery. In truth, she was fortunate. Very fortunate. She was well provided for and had a plan for the future. What more could she want for? “Has Mrs. Goddard ever taken in a student who proved an unworthy friend?” Harriet asked. “Well, I think the Miss Martins were rather plain, drab little things.” Wynne turned back to her netting. “I am sorry to hear you say that.” Mrs. Goddard walked in bearing a tray of tea things. “But that is for her own home, is it not?” Belinda puffed up like a scolding hen. Belinda tossed her head. She obviously missed Mrs. Goddard’s sharp warning look. Wynne rolled her eyes like she always did when Harriet spoke. That was something else of which Mrs. Goddard did not approve. Perhaps neither of them minded a scolding as much as Harriet did. “And they and I were very pleased at the way you dedicated yourself to their comfort, my dear.” Mrs. Goddard handed Harriet a cup of tea. “But their manners! You cannot say they were at all polished or even that proper.” Belinda reached for a cup. “Who is their brother?” Belinda was always interested in young men, particularly if they might have property. “I imagine Mrs. Martin is a very pretty and respectable wife?” Wynne snickered behind her hand. “The only Mrs. Martin is their mother.” Mrs. Goddard added sugar to her tea. Botheration. Belinda had that look in her eyes, the one that meant she was planning how to make others pleased to give her what she wanted. The one that made Harriet avoid her wherever possible. On the positive side though, perhaps Belinda would be nicer to the Miss Martins now. The next morning, Harriet was helping the younger girls with their lessons when the Miss Martins arrived. They waved at Harriet. Belinda and Wynne made space on their bench for them and beckoned them over. Rachel and Margaret whispered to each other for a moment, then sat with Belinda and Wynne as Miss Osgood continued her geography drill. What a horrid subject, geography. How boring to recall what strange names went with what little squiggly colored patch on the globe. What use was it to know such things when she would never see any of those places herself nor know anyone who would? Far more interesting was learning the plants in the garden and which would soothe the stomach aches and colds the change of seasons would inevitably bring. As well, at least if she had to study geography, she had her fair share of more interesting subjects as well. Even better, she could skip the lesson altogether today whilst helping the little ones with their penmanship. She bent over one of the youngest girls’ desk to help her hold her pen correctly. “Is Miss Smith a teacher here too?” Rachel whispered. Harriet glanced at them from the corner of her eye. “Miss Smith?” A small face looked up at her. She murmured something and returned to writing an awkward row of long ‘s’s in running hand across her paper. “I had no idea,” Miss Margaret whispered, with a sidelong look at Harriet. “She is nice and proper. She knows her place among her betters and that is a very desirable thing in a young lady. Her manners do her much credit.” Belinda started to bat her eyes at Harriet, but Miss Osgood’s sharp look stopped her. Even Harriet could tell Belinda spoke what she did not mean. “Continue your practice. I will return in a moment.” She tapped the desk and darted out. Once in the hall, she increased her pace to nearly a run until she escaped into the gardens. She gulped the soft air like a drowning man, but relief for her true need was not to be found. She ran for a cluster of trees, pushing herself until her sides ached and throat burned. But running only moved the pain temporarily from her heart to her body. She could not run fast or far enough to escape the truth of who she was—and was not. This was not the first time Belinda had reminded the other girls of Harriet’s pitiable state. Belinda was so conscious of status and rank! She loved to remind others of it and, it seemed, drew them to her like moths to a glittering flame. Sometimes it worked, and they treated Harriet coolly for a time, but sometimes it did not. It only made Belinda try harder. Could she not see that was not the way to attract real friends? Harriet was far from friendless—in truth, she probably had more friends than Belinda. That made Belinda jealous, or so Mrs. Goddard said. She insisted Harriet should feel pity for Belinda’s antics, not anger. Perhaps that was true. But it did not change the hurt plaguing her each time Belinda played her maneuvering games. “Harriet? Harriet?” Mrs. Goddard called, her voice distant, probably at the edge of the trees. “Here, madam.” Harriet dried her eyes with the edge of her chemisette’s high collar and hurried toward the voice. “Are you well child? The maid saw you run out and told me straight away.” Mrs. Goddard met her at the edge of the copse. “It is nothing. Only one of my flights of fancy grabbing hold of me once again. You know how I can be, dashing here and there after a stray idea. I should be getting back to the school room.” Harriet tried to pull away, but Mrs. Goddard’s kind grasp remained firm. “Yes, Mrs. Goddard.” She tried to hide her sigh in an ineffectual little smile. It was so difficult not to look fretful when one felt so. Mrs. Goddard led her along the garden path to the little white gazebo surrounded by heather and covered with ivy. It slanted to the left a bit and a few vines drooped inside, but that only added character, making it her favorite spot. “I am being foolish and petty.” Harriet mumbled, eyes fixed on a particular clump of heather that needed trimming. The soft green smells and the cool shade soothed the ragged edges of her spirit. This place always made the ache inside subside. It never really left, but it was made bearable here. Harriet shook her head in something that meant neither yes nor no. It satisfied most people enough that they asked nothing more. “True enough. But still, it does suggest I have been remiss and selfish.” Mrs. Goddard stood and dusted her skirts like she did when she was about to start to work. What would it be like having a home of her own? It never seemed possible. What an odd…and very pleasing thought. But very, very unlikely. Visit Austen in August again soon to read more! Impatient? Come visit my website. All subscribers will receive free copy of A Preference for Ginger, including the exclusive prologue and epilogue, not published anywhere else. I loved this story already and its just the beginning. That's great that Maria Grace wrote Harriet's backstory. I'm so glad you enjoyed this beginning! Harriet just grabbed hold of me and wouldn't let go. Surprise! :) Nice to encounter you, too! Thanks for joining us for this fun little ride! I love this story. Harriett is so sweet. I am so glad you are sharing this lovely back story. Thank you. Thanks, Deborah! I really enjoy writing backstories! This is a great beginning, Maria. I love to know who Harriet is before she met Emma Woodhouse. Thanks for a wonderful story.